Plastic. 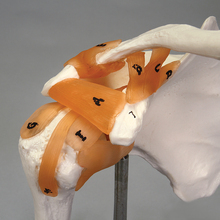 Approximately life-sized model features the bones and many of the major ligaments and tendons of the human shoulder joint. Eleven osteological structures and 9 connective tissue structures are numbered; comes with a laminated key. In 1 piece and mounted on a base. Size (with base), 24 x 14.5 x 12 cm. Plastic. 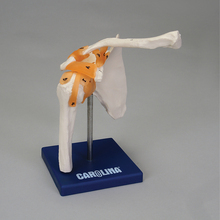 This approximately life-sized model features the bones and many of the major ligaments and tendons of the human shoulder joint. Eleven osteological structures and 9 connective tissue structures are numbered; comes with a laminated key. In 1 piece and mounted on a base. Size (with base), 24 x 14.5 x 12 cm.